Tom Freeman tries to get into the most stable position as quickly as possible. Efficiency of movement is critically important with sometimes tight time constraints. 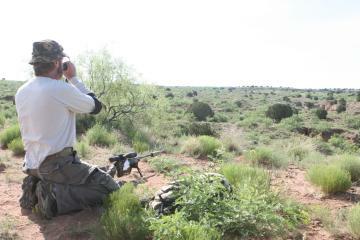 Dave Wheeler's Blue Steel Ranch property is located at 4000' altitude, populated with scrub brush and riddled with gullies and great sweeping ridge lines, which provides fantastic locations for both shoot positions and tricky target placement. While the travel time from station to station is not timed, the rough, steep terrain and often-brutal weather tax the shooter physically. Temperatures between 90 and 100 degrees are common. This year the winds were favorable at 0-10 average, with occaisonal gusts to just under 20 mph. Temperatures were 100-109F during the day. 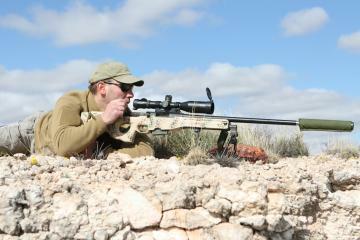 The author usually competes with an Accuracy International AW in .260 Remington. I didn't get to shoot the Steel Safari as a competitor this year, although I did "shoot in" both field courses the preceeding week. It is common practice for match staff to "shoot in" stages while finalizes the stage setups. The purpose is to find any final problems with shoot positions, target positions, terrain or organic features, and correct them to ensure safety and that each competitor has a fair challenge. This year I shot my AI-AW chambered in .260 Remington. Due to the match set-up schedule, I shot the entire match - both north and south courses - in approximately 4.5 hours on Thursday morning, and I was around 20 down by the end of it. Here's a brief overview of my setup. Accuracy International AW in .308 with a S&B PMII 3-12x50 mm scope, AI bipod, and Thunder Beast Arms model 30P-1 sound suppressor. I use the Swarovski Laser Guide range-finder and typically get by without using binoculars (if I need them, I have a set of Leica Ultravids). 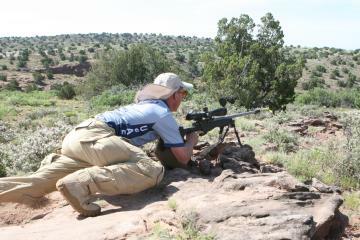 My load is a 139gr Lapua Scenar at about 2900 fps. This year the wind was under control and scores showed it, but extreme high temperatures took their toll on the competitors. It was recommended that shooters took at least a gallon and a half of water with them on the course, and even with this, some shooters were really beat by the end of day 1. After the Long-Range Side Match on Friday, two competitors decided they didn't have the gumption to shoot the match, and after Saturday, two more had dropped out. In any case, the favorable wind conditions were kinder to the .308 shooters than prior years, but unlike 2009, .308 was not the most popular cartridge. I attribute this to a higher level of competitiveness amongst the shooters.